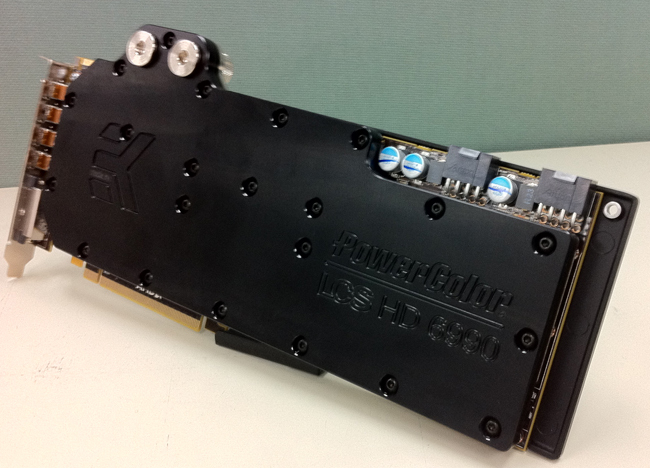 PowerColor will release a new HD 6990 video card complete with a waterblock according to DonanimHaber.com. The report has been confirmed by PowerColor and the card is expected to be released next month. The card features a EK waterblock with a copper base. 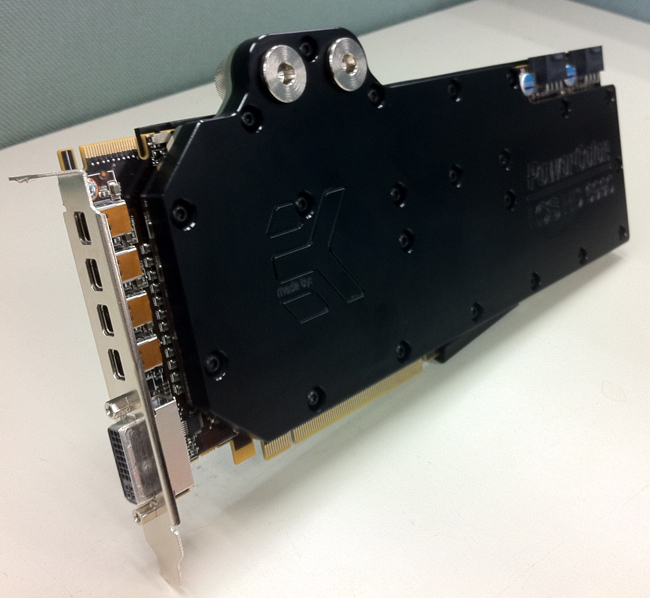 It is evident from the photo below that the waterblock will cover the GPU, memory and VRM. Judging by EK’s reputation alone, this waterblock should perform quite well. One unique concept is that the card only takes up a single slot instead of the typical dual-slot configuration. This makes it easier to house multiple video cards in tighter spaces, although with the sheer power of the 6990 (as shown in our review), most users will not need more than one. One thing is certain, and my fellow benchmarkers will appreciate this – the 6990 needs moar volts! There is lots of potential under this hood; it just needs some juice to get there, and possibly a different cooler. Can’t wait to see who comes out with the first software that can do it. When I find my HD 5850 to not be enough (which will soon happen when I upgrade my screen to a Dell U2711) this card with a waterblock may be the way to go.. My current case can't handle it obviously but would perhaps a 240 RAD be able to cool this beast? Gonna get the Corsair 650D. My god, that is a freakin thing of beauty! This is why I hate the fact that I have become addicted to OC'ing and watercooling: always spending money. The fact that EK makes this block makes me very interested. I think that they should send me one to test and possibly sponsor me for life!